The Best Fantasy Soccer blogs from thousands of top Fantasy Soccer blogs in our index using search and social metrics. Data will be refreshed once a week. 2.17 Who Got The Assist? 2.30 FANFEUD! – Fantasy Football Hints, Tips and FUN! Fantasy Soccer newsletter is a comprehensive summary of the day's most important blog posts and news articles from the best Fantasy Soccer websites on the web, and delivered to your email inbox each morning. To subscribe, simply provide us with your email address. England About Blog The Fantasy Football Pundits Provide News, Tips and Interaction throughout the Fantasy Premier League season. Find Captain Tips & Picks, each and every FPL Gameweek. Facebook fans 1,748. Twitter followers 118,813. Manchester, England About Blog The only fantasy football site with tips, advice and strategy for all formats. To help fantasy premier league mangers finish higher than they would without the site. To allow fantasy managers the chance to share their interest. Facebook fans 4,746. Twitter followers 3.
worldwide About Blog Use your football knowledge to compete against your friends & co-workers. Join EFL if you're up for the challenge! Get All the latest Fantasy Football news, tips and reviews from the EuroFantasyLeague. Facebook fans 1,205,961. Twitter followers 1,251. England, United Kingdom About Blog Fantasy Football First publishes articles and stats to help Fantasy Premier League managers, and provides a forum for discussing all things Fantasy Football to help you win your mini-league. We also provide How To guides and advice for newer managers. Facebook fans 1,060. Twitter followers 5,288. Brighton, England About Blog Fantasy Football Tips, News and Advice for fantasy games based on the English Premier League. Facebook fans 26,343. Twitter followers 66,404. About Blog Fantasy Soccer at Razzball is a fantasy Soccer blog dedicated to providing usable tips, advice and commentary for winning your fantasy soccer league. Facebook fans 6,332. Twitter followers 15,015. London, England About Blog To bring a new style of fantasy football game to football and fantasy sports fans around the world. America has had draft-style fantasy leagues for years and it's been a massive hit there. Our mission was to bring that same enjoyment to all those people that follow the English Premiership and were looking for a draft version of fantasy football. Facebook fans 8,129. Twitter followers 7,338. About Blog Fantasy Football 247 is a site dedicated to providing FPL managers with team news, reviews, transfer tips, captain picks and advice from the Premier League. Facebook fans 866. Twitter followers 33,930. About Blog Providing daily Fantasy Premier League news, tips and FPL bonus points. FPL Updates publish articles, news and statistics about the Barclays Premier League for Fantasy Football managers. We started the site because as fantasy football addicts ourselves, we knew that the use of statistics and various articles can be very helpful in assisting decisions. Facebook fans 1,477. Twitter followers 54,699. About Blog Welcome to Dream11, the world’s largest Fantasy Football game of skill! Fantasy Football is all about using your football knowledge and skill to create your Dream11 team within a budget of 100 credits in virtual money. Facebook fans 1,044,135. Twitter followers 17,647. Worldwide About Blog The ultimate fantasy soccer fan zone! Togga aims to build a global fantasy sports platform that increases engagement and awareness within the existing soccer community in addition to making the game more exciting for a broader audience. We are big believers in the growth story of soccer and fantasy sports and are creating the platform to converge the two. Facebook fans 2,143. Twitter followers 7,249. About Blog At FantasyBet, we take pride in creating fast-paced, highly entertaining fantasy games. Games that makes watching football a whole lot more interesting and fun.We aim to give you the ultimate fantasy football experience. Your number one strategy blog for Daily Fantasy Football. Read our articles and improve your win rate on fantasy betting! Facebook fans 1,260. Twitter followers 954. About Blog At AllThingsFPL we look to put the needs of our members at the core of what we do by ensuring our services are easy to use, easy to adopt and easy to deploy. Get the latest fantasy football tips, tricks and advice with our gameweek articles from the best writers around for the best community around. Facebook fans 7,895. Twitter followers 9,983. About Blog The SB Nation blog about (mostly Premier League) fantasy football. Facebook fans 1,577. Twitter followers 2,154. United Kingdom About Blog We are the new kids on the block for fantasy football and we plan on shaking up the way things are done. For too long the big boys have dominated the fantasy market; now we are giving you the power to make money from the content you create. We are on a mission to make fantasy football hub the home of fantasy football. Facebook fans 13. Twitter followers 868. United Kingdom About Blog Daily fantasy sports strategy, picks, tips, advice and rankings with Sportito. Facebook fans 24,302. Twitter followers 1,673. 17. Who Got The Assist? London, England About Blog Assisting with fantasy football advice, news and views. The Fantasy Football (Soccer – round ball!) site that is all about the first question that pops in to the mind of every FPL manager when a goal goes in, but their guy hasn’t scored. And some finance and psychology stuff, too. Facebook fans 82. Twitter followers 3,405. CT, USA About Blog Fantasy Premier League tips and cheats to give you a competitive advantage. FPL rank 1-2%. Download EPL, La Liga and UEFA Champions League YouTube podcasts. Facebook fans 639. Twitter followers 1,146. USA About Blog MLS Fantasy Boss is a fantasy MLS tip site and league. We use a combination of statistics and personal experience to provide suggestions, predictions, and reflection to all players of the Official MLS Fantasy Manger game. So take some time to visit, we'd love to have you. Facebook fans 116. Twitter followers 7,417. About Blog FantasyYIRMA is a site focused on Fantasy Football news, views & gameweek previews for the English Premier League. Facebook fans n/a. Twitter followers 40,555. About Blog Fplbet is a blog dedicated to Premier League Fantasy Football. Use our Fantasy Premier League tips, statistics and resources to win your fantasy leagues and prove yourself as the best Barclays Fantasy Football manager. Facebook fans 408. Twitter followers 6,973. About Blog The home of the best fantasy football minds in the industry - fantasy Premier League, Champions League tips and advice. Learn from the top players and improve your game. Facebook fans 761. Twitter followers 892. About Blog Welcome to footballadvice.co.uk, a platform hosting the latest tips and advice for FPL managers. Footballadvice.co.uk was created with the goal of teaching and inspiring players of all abilities to reach and exceed their full potential. We also have the latest tips and updates on fantasy football premier league, providing regular content on team selections and player updates. About Blog Statistical and analytical approach to Premier League Fantasy Football. About Blog The Gaffer Tapes is the UK's Biggest Fantasy Football Podcast and winner of 'Best Football Podcast' at the Football Blogging Awards 2016. Every week, we bring you the best in football, tips, comedy and nonsense. Facebook fans 240. Twitter followers 5,552. About Blog The aim of this blog is to encourage Sky Sports Fantasy Football discussion as well as tell you a few tips and tricks to beat you mates. Australia About Blog A global team of Premier League fans providing top level knowledge on Fantasy Premier League (FPL) to improve your overall rank and enjoyment of the game. Facebook fans 312. Twitter followers 10,309. About Blog Fantasy Football Surgery, a weekly podcast discussing the world of FPL with light-hearted humour from a team of football nuts and stats gurus. Facebook fans 310. Twitter followers 3,198. Christmas Island About Blog Not sure who to pick in your #FPLteam? Well look no further! Top 0.2% finishes in the last 2 seasons fpl hints fpl fantasy premier league. Facebook fans n/a. Twitter followers 37,448. 30. FANFEUD! – Fantasy Football Hints, Tips and FUN! Dublin City, Ireland About Blog The concept of the game is simple but effective - all you have to do is pick five players, any five from the squad of players on show. Fanfeud players score points for positive events (for example, a goal scored) while points are lost for negative events (for example red cards). The person with the most points at the end of the game wins the pot. Facebook fans 1,460. Twitter followers 5,019. Lynchburg, VA About Blog This podcast will focus on the EPL and how to play fantasy soccer during the Premier League season, and the guys will have a ton of fun while doing it. You will enjoy this podcast, and it just might teach you more about soccer than you knew before you listened. Facebook fans 43. Twitter followers 212. Premier League About Blog Unique 11 is the perfect Fantasy Football experience. Pick your own unique team and compete head to head every gameweek. Play with fellow football fans in a public league or create your own private league to play with friends. Draft day is the biggest day of the football season! Get together for a draft party or login to pick your players online. Facebook fans 843. Twitter followers 8,099. About Blog Ball Manager Malaysia main goal is to support the development of Malaysian Football. That's what makes us have incredible passion. Facebook fans 681. Twitter followers n/a. Malta About Blog FantasyXL is the first daily fantasy soccer site with 24/7 action! Facebook fans 99. Twitter followers 124. 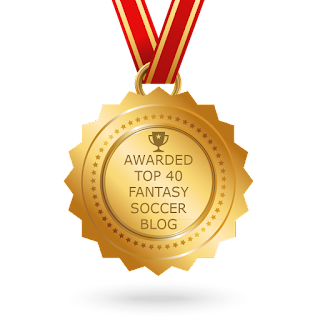 CONGRATULATIONS to every blogger that has made this Top Fantasy Soccer Blogs list! This is the most comprehensive list of best Fantasy Soccer blogs on the internet and I’m honoured to have you as part of this! I personally give you a high-five and want to thank you for your contribution to this world.